On the right is a photo illustration and the accompanying article’s title typography from an cover article in a 1968 issue of LIFE Magazine. In the article a young man from the ” younger generation” and his middle aged uncle of the “older generation”, debate and discuss their opinions and the “generation gap”. They cover their views on all types of things, including the war that was going on at that time in Viet Nam (young men were still getting drafted for mandatory service in the war in 1968 and going straight into live combat after boot camp.) 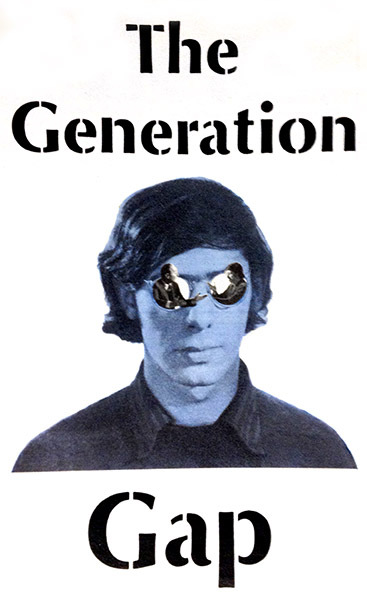 Reading the article and knowing the content explains, why in the duotone graphic, there are people coming out of the young lad’s, round spectacles! A very cool and historic retro graphic and a really interesting look back into that time in America!